American orchestras, American industry and American music. Performed live by visual media artists The Now Device in collaboration with orchestras around the country, the show features larger-than-life imagery of local factories and live video of the conductor and musicians. This visual spectacle is choreographed in real time, and set to classic symphonic works by American composers such as Aaron Copland, Leonard Bernstein, and John Corigliano. The result is a powerfully immersive, aural and visual experience that tells the inspiring tale of manufacturing’s vital contribution to our nation’s past, present, and future. I’ve heard from several patrons how much they enjoyed American Made: the Art of Manufacturing and I’ve literally been stopped on the street to talk about it. People were very excited by this program. I’ve seen the show three times and it just gets better. We need to bring this to Grand Rapids. This was so much different than what (the sympony) normally produces, I felt really inspired, really proud of this community – all its people and industries. We’ve got to do this again. 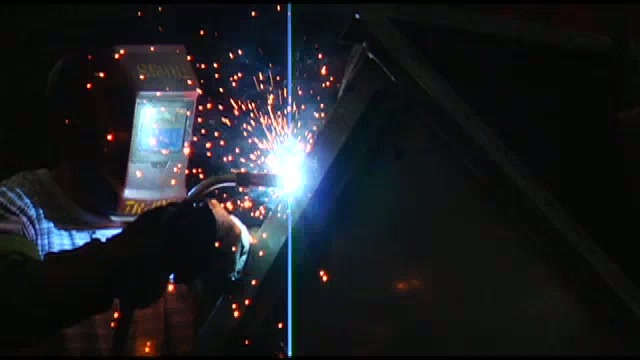 This project owes its origin to Jim and Dan McGregor of the McGregor Metalworking Companies (Springfield, OH), who were looking for ways to tell the positive story of American manufacturing today. At their request, the Springfield Symphony Orchestra took up the challenge of telling that story in a way that could reach and move general audiences. The SSO teamed with Seattle-based media arts ensemble The Now Device to develop a multi-media experience, combining live orchestral music with exciting visual imagery. 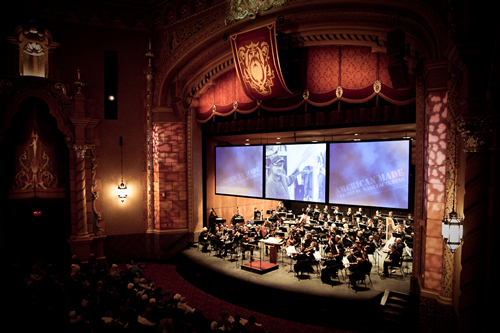 The result: American Made was conceived, developed and first performed as a partnership between The Now Device and the Springfield Symphony Orchestra in Springfield, Ohio in the fall of 2007. SSO Executive Director David Deitrick and Music Director Peter Stafford Wilson developed the musical score and worked in coordination with the TND team to outline and develop the shape and content of the show, both musical and visual. SSO remains connected to the show and provides continuing support in terms of professional consultation. How does the ‘custom’ part of the show work? Each production of American Made is unique. The Now Device creative team shoots custom footage and photography of local manufacturers in the community where the show will be performed. This local material is then carefully incorporated into the show, which features historical and national footage from a variety of sources. In Springfield, Ohio, for example, we shot in over 25 local and regional manufacturing facilities, capturing large amounts of beautiful footage which then became the core of the visual show. What is the ‘live’ part of the show? Because the music is performed live by the orchestra, each show varies. In order to coordinate the visual imagery with the music, The Now Device uses computers, custom software, digital video mixers and live cameras together to ‘play’ the show in real time, typically from a station next to or within the audience. The presence of the live video mixing and camera operating team adds another level of interest for audiences, without distracting from the overall experience. How long does it take to mount a performance? Our working schedule is flexible, but typically begins about 6 months before the performance date. 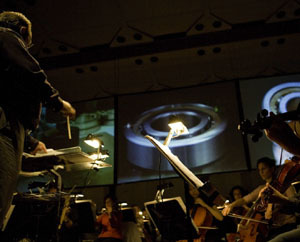 During this time the symphony organization is able to contact and incorporate sponsors and participants, and the TND team, with logistical aid from the symphony, visits the performance space for stage design preliminaries and sends out a team to acquire custom video and photography at local manufacturing facilities. Adjustments can be made to complete a production with less lead time - contact us for details. Is it hard to get local companies to participate? In our experience, the reception in the local manufacturing community has been very enthusiastic, both in terms of financial support and in terms of opening their facilities to our videographers/photographers. In the vast majority of cases, manufacturers are proud to show the work that they do, and are interested in this unique opportunity to engage with local arts. The Now Device can provide you with materials to promote and explain the show, whether for convincing board members, attracting sponsors or for increasing attendance. Much of the material on our web site is available in DVD format and we have additional documentation of previous shows, press-ready photos and press release templates and supporting materials. Are there additional ways to involve schools and students? The combination of media, manufacturing technology and arts provide many opportunities to involve students and younger audiences. In Muskegon, for example, the West Michigan Symphony arranged a mini job-fair, allowing high school and college students to interact with sponsors before attending part of a working rehearsal. Student attendance at daytime dress rehearsals works well. The Now Device is always interested in and available to brainstorm ways to further involve the community, particularly children and schools. This could include: pre-show talks; employment of student interns on our crew; pre-show workshops for local arts/media students to produce materials included in the show. American Made: The Art of Manufacturing is one of several innovative productions that have helped cultural institutions engage new audiences and forge closer bonds with local businesses. The Now Device also employs its visual media expertise to turn parties, openings, and other events into mesmerizing, one-of-a-kind spectacles.